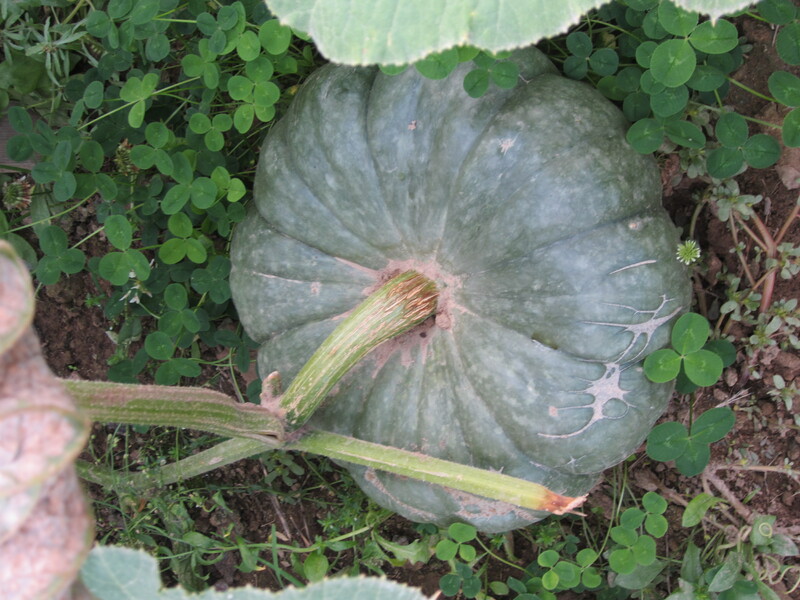 Winter Squash & Pumpkins, 2012 Harvest! 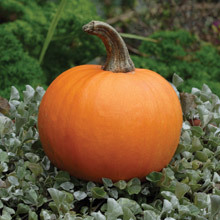 We have finished our 2012 harvest with a wonderful selection of WINTER SQUASH & PUMPKINS. All of our fruit and vegetables are organically grown. 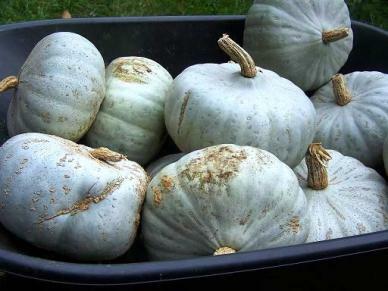 BABY BLUE 4-6 lbs., sweet dry thick orange yellow flesh, light blue skin, semi bush, good keeper. 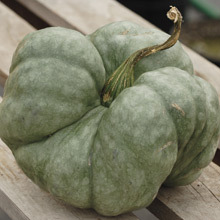 GALEUX D’EYSINES SQUASH HEIRLOOM An elegant French heirloom with an appropriately elegant sounding name. Magnifique! 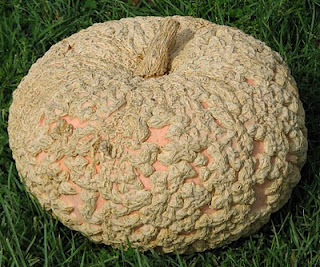 This stunning squash has beautiful salmon-peach colored skin covered with peanut shell-like warts caused by sugar in the skin. 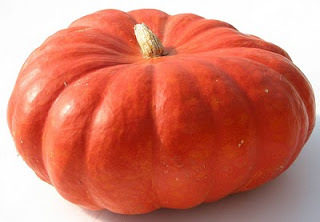 Traditionally used in France for soups and sauces, when cooked, the sweet, orange flesh is as smooth as velvet. 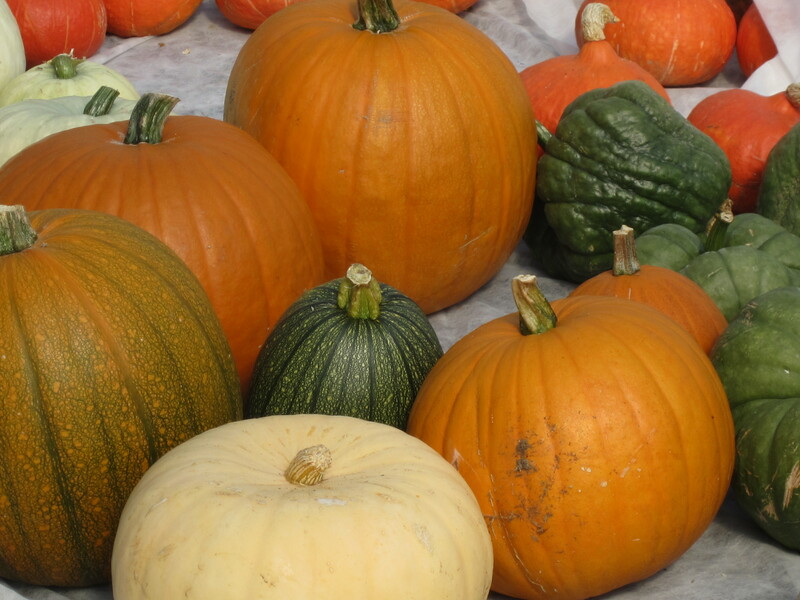 Each flattened squash weighs 10-15 pounds and can store for up to 6 months. Definitely a show stopper in the garden or on the table. 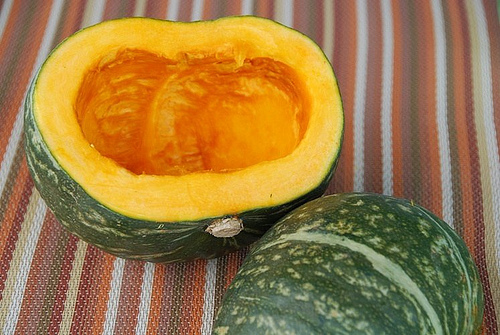 KABOCHA (Japanese Pumpkin) Brilliant yellow-orange flesh, like a pumpkin’s. 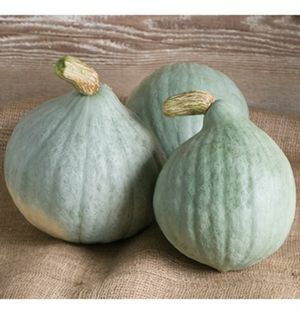 Both the texture and flavor of Kabocha squash is similar to a sweet potato: the soft, moist, fluffy flesh is surprisingly sweet and slightly nutty. IT is so naturally delicious, that you could eat it simply roasted and unadorned. QUEENSLAND BLUE HEIRLOOM Dark blue-green ribbed rind with flesh that is meaty, sugary, brilliant orange, and abundant. 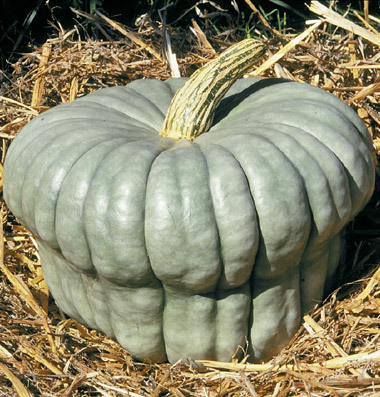 Beautiful blue turban-shaped 10-20 lb. fruit, deeply ribbed. A good keeper. SWEET MEAT HEIRLOOM It not only has a creamy dense texture, but its flavor is rich, buttery and distinctive. It makes the best pies, the creamiest soups, the most savory side dishes and the tastiest muffins. A good keeper. 10 – 15 lbs. TRIAMBLE HEIRLOOM This bizarre curiosity has three lobes – and three seed cavities. 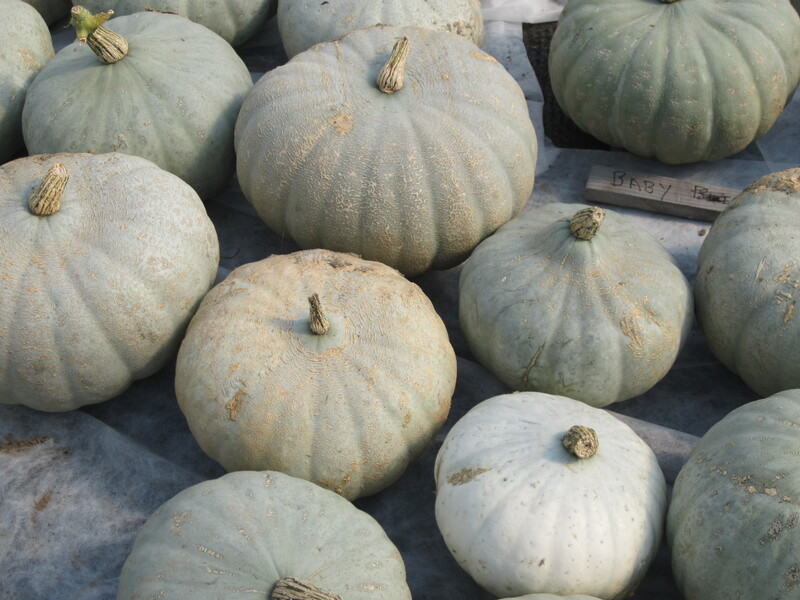 Bluish grey skin covers dense, orange, sugary flesh that holds its flavour for a remarkably long time. A bit slower to mature, but a very long shelf life. 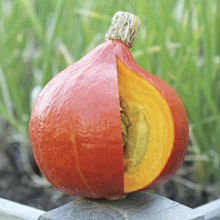 JACK OF ALL TRADES This versatile variety gives lots of dark-orange Jack-O-Lanterns that colour quickly on a tidy vine. The strong handles let kids gather and carve their prizes happily. 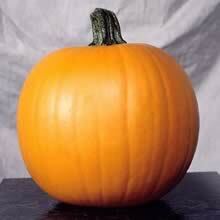 This fairly round high quality, mid-sized 5–7kg (10–15lb) and 30–35cm (12-–14″) charmer is also fine for pies. LITTLE OCTOBER Perfectly-shaped small pumpkins, and they taste great, too. ROUGE VIF D’ETAMPES HEIRLOOM This centuries-old French HEIRLOOM is also charmingly known as Cinderella. 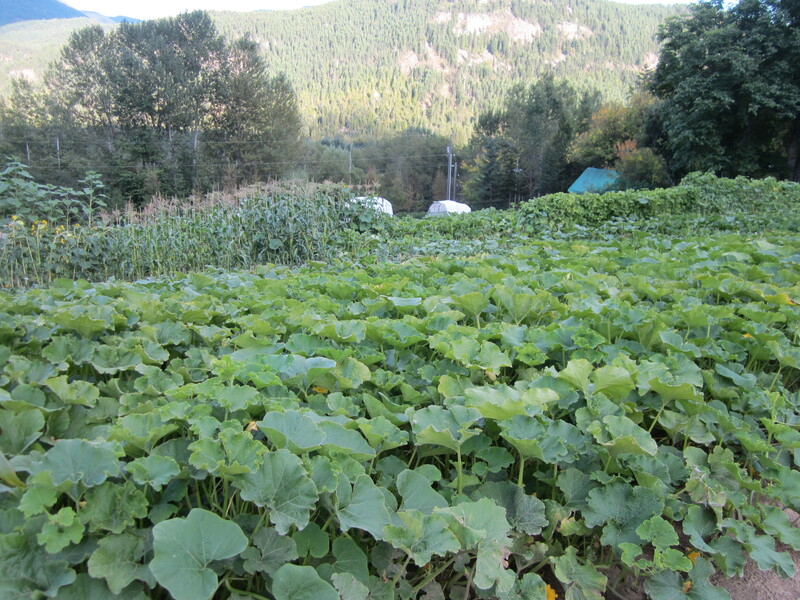 Beautiful reddish-orange, flat pumpkins with deep ridges are the first to colour in the patch. Each medium sprawling vine gives about six lovely 9kg (20lb) treasures that are good for artistic carving, decorations, and winter meals.